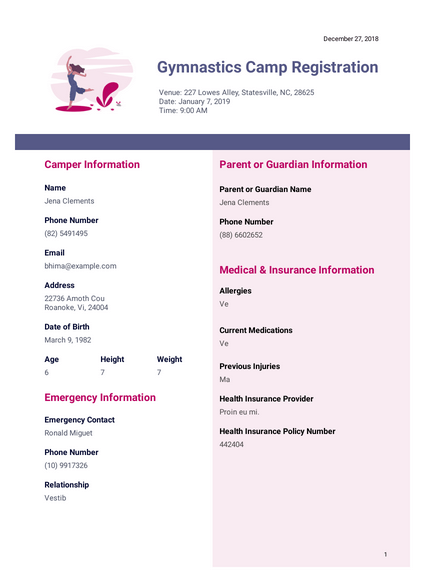 Whether your gymnastics camp is for beginning tumblers or aspiring Olympic medalists, JotForm’s Gymnastics Camp Registration PDF Template is the perfect tool to manage incoming registrations. Raise the bar for your camp by instantly saving gymnast information as PDFs that are easy for coaches to access, download, share, and print. With JotForm’s PDF Editor, you can change this flexible PDF template to match your existing registration form. Rewrite text, rearrange form elements, add your camp’s logo, and make whatever other modifications you’d like. With submissions automatically converted into personalized PDFs, you’ll finally have a trustworthy registration tool that sticks the landing. or falling the head or neck. I, the undersigned, do hereby grant the authority to the staff of [Organization Name] to apply judgment in regards to medical assistance in the event of an accident, injury, or illness if they are unable to contact the parent or guardian. I authorize first aid, a medical or surgical diagnosis and treatment which may deem necessary. I, the undersigned, release [Organization Name] and any of its coaches, staff, manager, and/or any parent for any responsibility in case of accident, illness, or injury during my child’s enrollment. I confirm that the information given in this form is true, complete and accurate. I have read, understand and agree to all statements on this form.